BOSTON – The acclaimed director Scott Edmiston is a strong admirer of the work of iconic American playwright Eugene O’Neill – it’s been the case since he was 17 – so much so that he took it upon himself to make one of O’Neill’s older works that’s rarely performed locally more accessible, and introduce it to a new generation of theater-goers. Edmiston’s adaptation of O’Neill’s “Anna Christie” now at the Lyric Stage Company of Boston has been stripped down, shedding a few characters and distilled to its core elements: the relationship between an aging coal barge captain and the daughter he hasn’t seen in 20 years, and the man who inserts himself between them. The result is a piece that gets to it much more quickly, eschewing some of the longer speeches and passages that turn O’Neill’s works – as wonderful as they are – into tests of stamina. An upcoming production of “The Iceman Cometh” on Broadway will run three hours, 50 minutes with two intermissions. “Anna Christie” did win the 1922 Pulitzer for O”Neill – one of his four – and in Edmiston’s re-tooling it remains a showcase for three actors, with a strong support from a fourth. The estimable Johnny Lee Davenport is a towering physical presence as barge captain Chris Christopherson, a weary old salt who has seen much too much of “that old devil sea” and hardly anything of his daughter Anna (Lindsey McWhorter), whom he hasn’t seen in 20 years . After the death of his wife, Chris brought Anna to Minnesota to live with her cousins, and for all Chris knows, she finally decided to leave that home and work as a nurse’s aide. Now a letter has arrived for Chris telling him to expect a visit from Anna. Anna has been ill, but has now recovered enough to visit. That’s not good news for another world-weary soul named Marthy (a wonderful Nancy E. Carroll ), Chris’s live-in friend who is being displaced by Anna, who intends to live on the barge with Chris. Carroll’s character is a welcome bridge to the eventual reunion of Chris and Anna and disappears much too soon. Dan Whelton is a brawny Irish stoker named Mat Burke who washes aboard Chris’s barge along with several of his shipmates, and sparks fly almost immediately between he and Anna, and she admits there is “something different” between Mat and the other men she has come to know. Chris knows only too well how a life at sea can destroy relationships, and having Chris and Anna be African-American and Mat white adds another dimension to his objections to their coupling. When Anna confronts her past – a past that includes two years as a prostitute, the residue of a childhood that saw her raped at 15 by a cousin –it sets the stage for confrontations. The emotions run strong and high, and issues are met head-on. O’Neill’s charges drink, fight and love too hard, and the ensuing fireworks are the hallmark of his works. In that manner, Davenport, McWhorter and Whelton don’t disappoint, their psyches stripped bare, and guilt and regret the order of the day. 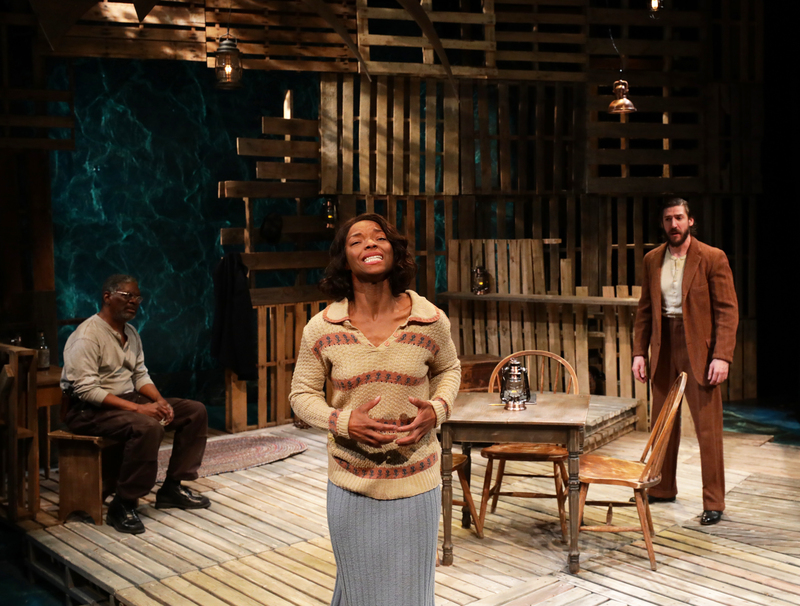 Janie E, Howland’s nautically-themed set has wooden slats that suggest seaside bar in New York City or the coal barge itself, with glimpses of the shimmering sea as the barge is docked in both Provincetown and Boston, symbols of O’Neill’s close connections to the two communities. Edmiston;s direction is as taut and tight and the pacing as crisp as any previous O’Neill production I’ve encountered. It is s a bit unusual in that while it reaches the crescendo of many of O’Neill’s works, it exits the stage with a whimper. 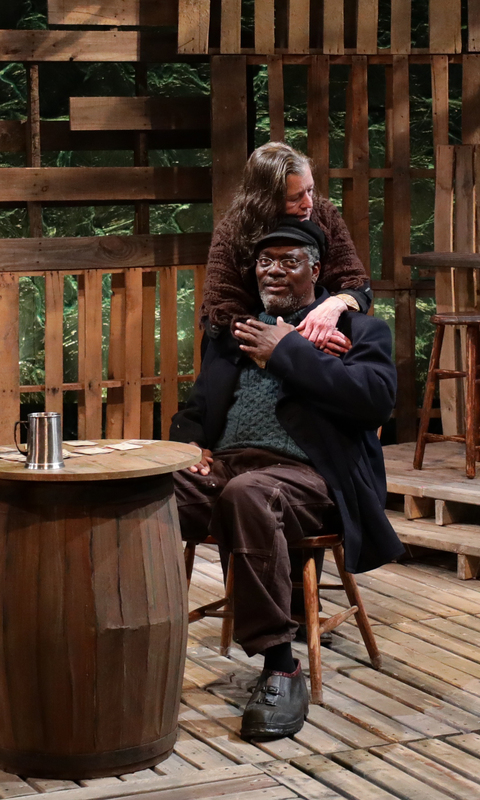 Still, the waves of emotions crashing across the stage from actors the caliber of Davenport, McWhorter, and Whelton make “Anna Christie” both fun and harrowing to watch at the same time. The Lyric Stage Company production of Eugene O’Neill’s “Anna Christie.” Adapted and directed by Scott Edmiston. At the Lyric Stage Company of Boston through May 6. lyricstage.com.